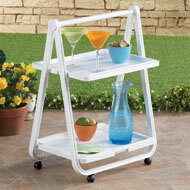 Blue Butterfly Rolling Shelf Cart from Collections Etc. $24.99 $12.97 Save up to 48% Now! This charming shelf adds a touch of charm to your kitchen and offers versatile storage space at the same time. 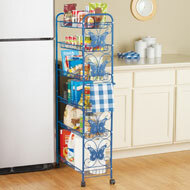 The blue metal cart features 3 tiers, smooth-rolling wheels, a towel rack and features beautiful butterflies on the sides. 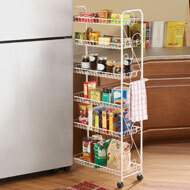 Perfect for storing pantry items, cookbooks and more! Some assembly required. Metal. 21"L (23"L with handle/towel rack) x 10"W x 28"H.
Works great in my bathroom for my towels - Shadow, Great Falls MT. I use it in my Kitchen, just fits. - No account., Tucson, Arizona.  LOVE IT TO STORE LITTLE ITEMS .. - ANN, WAREHAM,MA. Nice addition to my kitchen. The cart is smaller than expected, but I put it next to a cupboard where it fits nicely and I put our bottled water on the second and third shelf and bag snacks on the top shelf, works really good as I live in a mobile home and space is limited. - JB, White Lake WI. It looks like it would hold larger containers and the top shelf is the only one you can fit larger items on. Little to NO room to put things on the second or third shelf. Not very useful. - Fran, O'Fallon Mo.